A Kippah is the name for the skullcap that Jewish men wear on their heads. The word Kippah means ‘dome’ in Hebrew, due to its curved shape. Yiddish-speaking Jewish communities in Europe used the word Yarmulke instead of Kippah. The religious purpose of wearing the Kippah is to signify that God is above everyone. It has become an accepted custom amongst observant Jews to wear the Kippah at all times. Less observant Jews may choose to only wear a Kippah whilst attending a religious service at a synagogue. 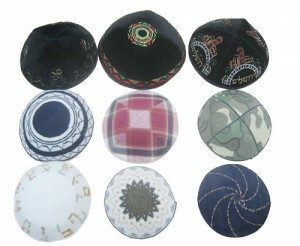 Kippahs are made from all kinds of cloth including cotton, wool, silk, satin and nylon. Decorations range from plain single colors to intricate multi-colored patterns. Non-religious Jews and gentiles often wonder how the Kippah remains on the head, as it does not grip the head in the same way as a cap or top-hat. The answer is that it can be fastened in multiple ways – mostly, it is just a friction fit and Jews just learn not to jerk their heads suddenly. Other times, the hair is cut in a way to contour to the inside of the kippah. Some people attach Kippahs with hair clips or velcro pads, but many would consider this cheating. Jewish women generally do not wear kippahs, but married women are required to cover their hair in some way, commonly with a hat, beanie or a wig.